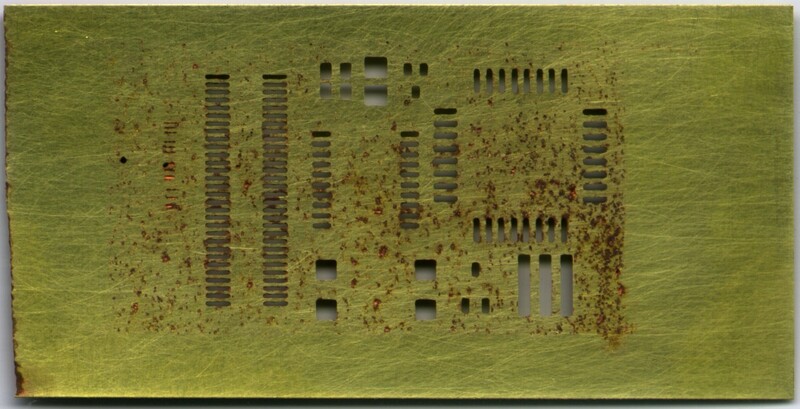 A sample of what the paste looks like on the board. I ended up shrinking everything when I did the "official" stencil. This is my second attempt at brass etching. The pattern and procedure are the same as yesterday. Even though everything turned out to be "worst case", the results are still good enough to use. 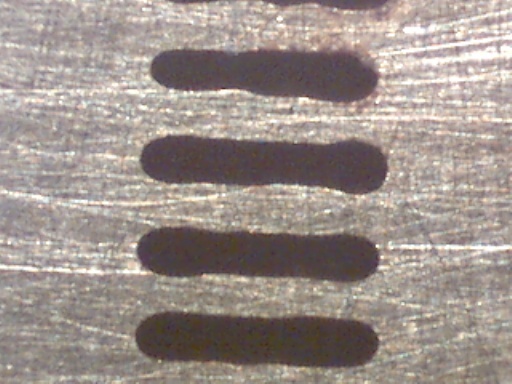 This time the etch was FeCl with the "floating" technique. I poured some FeCl in a plastic tub, and just "floated" the brass on the surface. I actually had a piece of wood cut as a holder, which rested on the bottom, but it positioned the brass right at the surface. Total etch time was 100 minutes (1h20) with room temperatore FeCl. However, I admit that the FeCl was the same as yesterday, so it's a little used. I fiddled with the printer settings, but the results were very poor. You can see all the places where the FeCl seeped through pinholes in the toner, but since this is a paste stencil it's not that important. 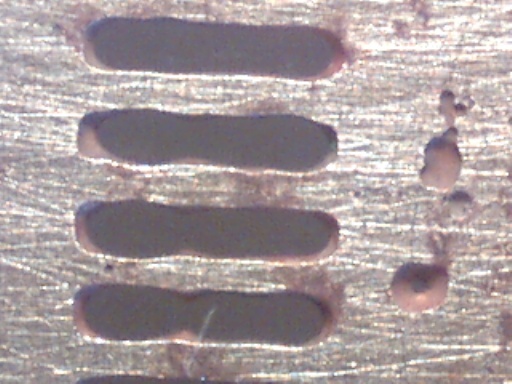 60x microscope view of an 0.50mm pitch SMT connector. This is the top view (i.e. the side I etched from) and you can see that the sides aren't as angled as yesterday. 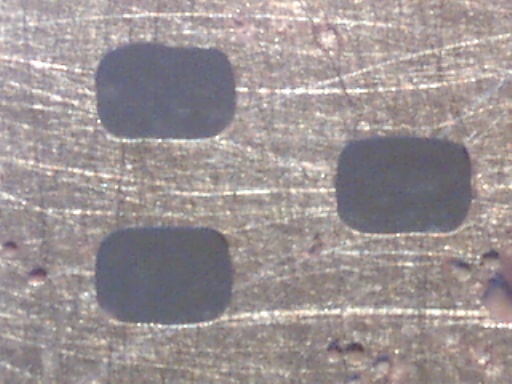 However, you can see the results of pinholes in the toner - it can sometimes etch through. 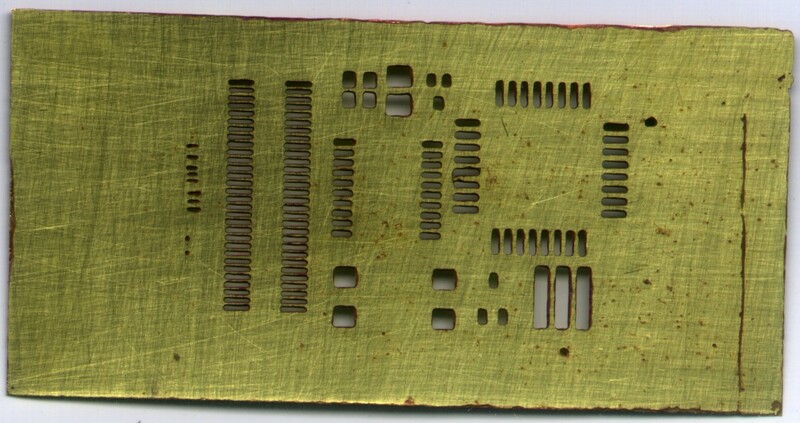 Since this is a solder paste stencil, such pits and holes don't really matter. Same connector, but this is the "bottom" side (the side with the tape on it). This is a SOT-535 transistor. As you can see by the pitting, this is the top side, but note the lack of angled sides like we had yesterday. Still don't get square holes, though. 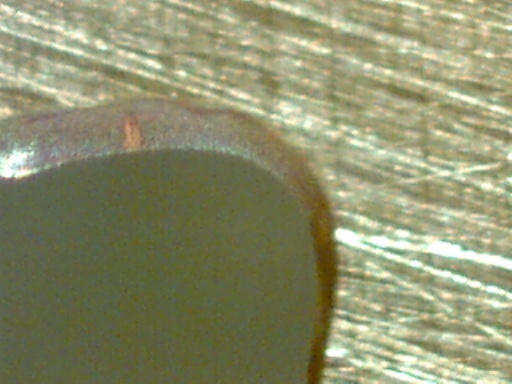 200x view of the same holes, showing off the edge. This is my first attempt at brass etching. The pattern is just a small test that has some parts I'll be needing in a larger board next week. The material is 0.005" (5 mil) brass sheet, which I picked up a local hardware store. The pattern is applied on one side with toner transfer (Pulsar paper, HP 2550N printer, six passes through the GBC laminator) followed by the green TRF. 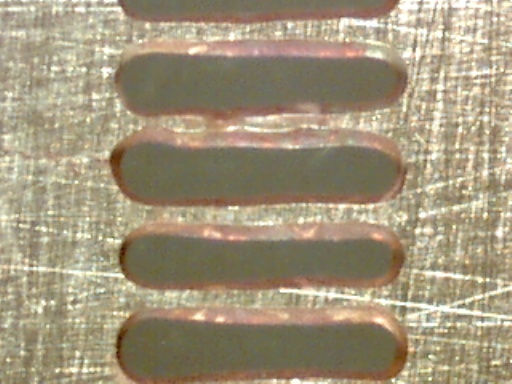 The reverse side was covered with common cellophane tape, although the edges came loose during the etch and some FeCl got under. It discolored the surface, but didn't really harm anything. 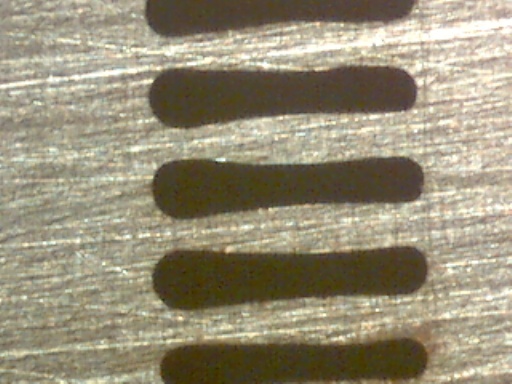 The etch was FeCl with the "wiping" technique. I poured some FeCl in a plastic tub, and used a sponge to wipe the FeCl across the brass. 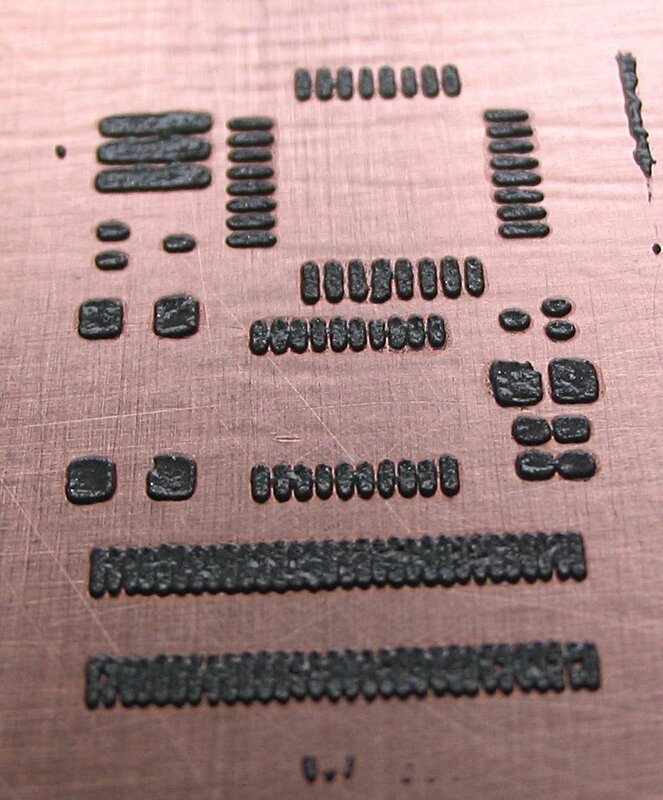 This allows me to control the etch, and give more attention to areas that are etching more slowly. Total etch time was 20 minutes with room temperatore FeCl. 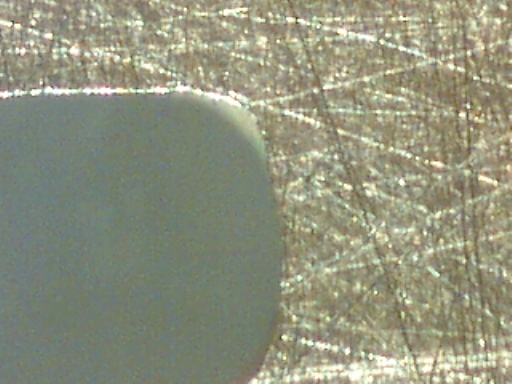 60x microscope view of an 0.50mm pitch SMT connector. This is the top view (i.e. the side I etched from) and you can see the angled sides. This means that the "top" of the real stencil needs to be the "board" side so that the paste releases properly. Same connector, but this is the "bottom" side (the side with the tape on it). The nice thing about using transparent tape, is that I could just hold the board up to the light and get a good view of how the etching is progressing, and where more attention is needed. This is a SOT-535 transistor. The pad is 20x30 mils, with a 20mil pitch (40 mils between the two left pads). Even though I shrunk the pattern by 2 mils on each edge, I think I need to shrink it some more. 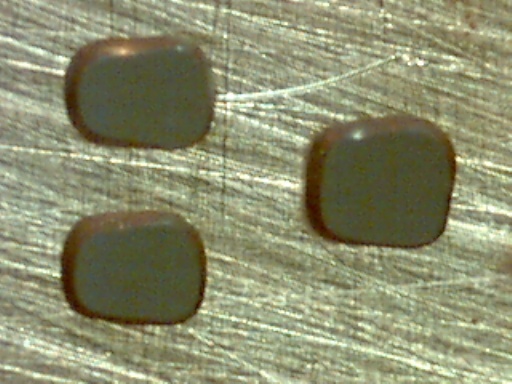 200x view of the same holes, showing off the bevelled edge again.